Tonight at Elimination Chamber, a new SmackDown Women’s Champion was crowned as Naomi defeated Alexa Bliss. Naomi went for a quick roll up at the start of the match and followed up by taking Alexa’s head to a trip around three turnbuckles. The challenger followed up by hitting a roundhouse kick from the apron but the champ knocked off her opponent back into the ring. When Naomi went for a speedy maneuver to Alexa, she found herself crashing to turnbuckle Naomi thanks to Alexa countering out. Alexa would proceed to apply illegal hair pulls to Naomi. Both Superstars reached a stalemate after trading pin covers and striking respective kicks/punches to the head. Once both women got back to their feet, Naomi kept the offenses rolling with a blockbuster and Rear End combination by Naomi nearly put away Alexa but the champion managed to kick out in time. 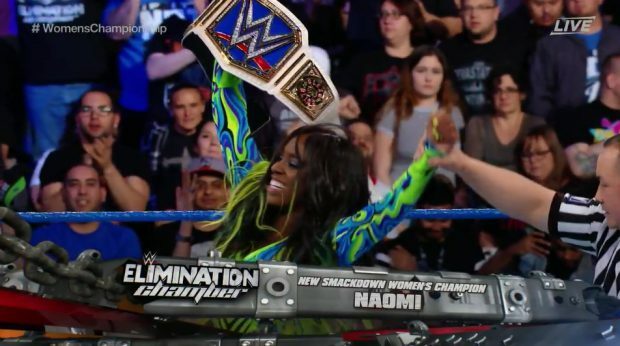 In the end, it was Naomi’s counter of the Twisted Bliss using her knees that knocked the champ off her game, as it opened a window of opportunity for Naomi to nail the Springboard Moonsault for the three count win. Post match, Naomi was greeted to “You deserve it chants” during a quick interview with Renee Young. Naomi went on to say she envisioned this moment for many years and is ready to walk into her hometown with the title around her waist in time for WrestleMania.